It is with a very heavy heart that we announce that Richard Coughlan passed away on Sunday 1st December. Richard was a founder member and drummer for Caravan for over forty three years. Richard died at his home and had been in poor health for the last few years. He has played on all of the band’s releases to date and was one of the early birds in the history of the Canterbury bands having sessioned with The Wilde Flowers and predecessors. Despite not being well Richard played percussion at Caravan’s reunion gig in London in December 2010 and received a standing ovation. His unique style of playing and wonderful character will be sorely missed. We pass our sincere sympathies to Richard’s wife Sue, his daughter Beth, and all his family. We will publish a fuller obituary in due course and will have a book of condolences on the website so that his friends and fans can leave a message. Richard Coughlan’s Funeral. Richard was cremated on Friday 20th December. There were approximately seventy of his friends and family to bid him a fond farewell. His drum sticks were lain crossed upon his coffin. Richard Neame gave an excellent eulogy that summed up Richard’s unique character perfectly. The sound system then played ‘Place Of My Own’ from Caravan’s first album which was a perfect tribute to Richard as the drum role at the beginning of that song was a trademark to Richard’s drumming. Following the service we then had the ‘wake’ at the Two Sawyers pub in the centre of Canterbury and Richard’s wife Sue and daughter Beth provided food for us. There is talk of an official memorial concert for Richard in April featuring local Canterbury musicians – this will be a fitting tribute to a great man. RIP Richard Coughlan, you will be sorely missed, but you will be remembered forever through your music. This entry was posted in News on December 8, 2013 by Martin Davenport. Went to Canterbury about 5 years ago and visited Richard’s pub was there about half an hour when he came in after walking his dog. Never got a chance to speak to him so was very sad to hear the news. We loved you Richard. I would like to pass on my condolences to his family, friends and band members. Me, a fan for many, many years, Richard was a true maestro of the drums, a legend, who will live on forever in Prog Music scene and his style and creativeness will be dearly missed. Really sad to hear that Rich passed away,many happy memories of him and his funny little laugh. Regards to all his family and friends and band members, he was a great bloke and larger than life. Rest in peace Richard, and thank you for the great pleasure that you have given to me through the music of Caravan. Lovely words Mark. I discovered Caravan in 1971 and have been a fan ever since. They were reponsible for opening my blinkered northern soul boy mind to the appreciation of other music. My first date with my wife was at a Caravan gig in 1972. My kids have all been to more than one Caravan gig with me. I was at the King’s Head in Fulham when the band received the belated gold disc for LOGAP in 1996 (but too shy to say hello). Subscribed to the fanzines before the www. And so on. 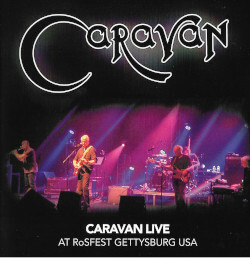 Caravan have been a significant part of the tapestry of my life and Richard’s passing has saddened me immensely. I have sat (and stood) countless times marvelling at his playing. I still do. Thank you for some great memories Richard.